When I put out the call recently for guest bloggers on the TBEX blog, Isabel Leyva contacted me almost immediately offering to send in a post with tips for conference attendees that were heading to Girona. What makes her the right person for the job? She’s from Girona! Here are Isabel’s picks for budget eats in her city. Eating great dishes for a small amount of money is really easy in Spain. Girona is an expensive city if you compare it with other Spanish cities, but on the other hand food and creativity is extraordinary, because we have great cooks. All restaurants do a special menu during lunch, with the same quality for less euros – this is a great way to go to a good restaurant. For example, you can go to a seafood restaurant with two dishes, dessert, and a drink for around 16€. But these lunch prices are only available from Monday to Friday. If you want to go to dinner and not spend too much, we have good options that are very popular among young people. All options cost around 10-15€, but of course, it depends on what you ask for. Here are four budget-friendly restaurants in Girona you should try. Konig has the best patatas bravas in Girona, great salads, tasty American sandwiches, and great fast service. It has different locations along the city, but the best one is near Sant Fèlix Cathedral. It has a great open terrace and the views are really nice. Usually is very crowded, so is better go outside of the rush hours. Tip: I always ask for patatas bravas, and a Chicago sandwich or Elisabetta salad – a dilemma to decide! One of the oldest restaurants in Girona, Le Bistrot has an exceptional location – the Sant Domenec Stairs. It is one of the most popular Girona spots that appears in a lot of films and advertisements – as well as almost all the travelers guides. The restaurant has a different way of presenting dishes. Dishes that usually restaurants serve on a plate, they offer it on a pagès bread, a tipical bread from Catalonia. Tip: Escalivada is my favourite one. Basque tapas are very famous in the north of Spain. Very close to Le Bistrot we can find Zampanzar, that offers some of the best tapas in Girona. Located at Plaça del Vi, you can eat them standing up or seated while you drink txakolí. Also ask for pulpo a la gallega or chocos, tapas from the south of Spain that they cook very well. Tip: The salt cod basque tapa is to die for! If we talk about the most popular Catalan foods, pà amb tomaquet (bread with tomato) is the main one. In one of the last Girona historical neighborhoods to be renovated, inside an old house we find El Cau del Llop, which offers typical Catalan cold meat (such as jamón, fuet, botifarra) on pà amb tomaquet. Also, during winter, the restaurant has a wood oven where they cook great meat, and the whole atmosphere makes you feel really comfortable. Tip: Ask for toasted bread with garlic and tomato, it’s really delicious. Be sure that you don’t have to kiss anyone after that! Isabel Leyva is an accountant and adventurer who is passionate about social media. Her blog, La 5th con Bleecker St., is where she shares her love for New York with her Spanish readers. Her blog won the Mujer It award in 2011, given by the Spanish magazine Mujer Hoy, for the best Leisure time and Actuality blog. I’m from Barcelona and I’m looking forward to live Girona like a local in a few days. These recommendations sound delicious 🙂 Let’s try Girona’s best patatas bravas! (although pa amb tomàquet will also be a must for everybody I think). Those patatas bravas are just… Oh my god! Believe me, I’m local! By the way, if you like good food, you can’t miss the welcome reception on Thursday night at the Castell de Sant Gregori! Great recommendations. 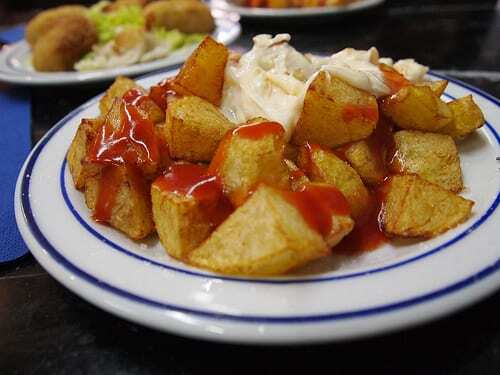 The best patatas bravas in Girona….definitely worth a try! Oooh, thanks for the additional tip!